Refurbished stock in good condition, may show signs of use to the rear casing with no scratches or marks on the screen. See below for a more detailed description. This iMac has the same Tapered Edge design as it's predecessor but with Intel's more advanced Forth Generation processor and architecture. Combine the newer Core i5 processor, faster WiFi and graphics, for a great performance improvement. You will find that this iMac will have no problems running demanding applications such as design suites! All of our iMacs ship on a Next Day By 12:00 service as standard and at no extra cost! Just remember not to select this service at the checkout. Our Refurbished stock is in good condition and made to look as close to new as possible. It may have some marks and show signs of use on the back or the stand. It will have no scratches or marks on the screen. All of our stock goes through thorough testing according to our Q20 Promise and is backed by a 12 month comprehensive warranty. The Apple iMac 21.5" Core i5 2.7GHz Late 2013 is a very good spec, high quality iMac with a sleek and stylish design featuring a razor-edge 5mm Tapered Edge. Great for casual and business use, it’s secure and user friendly. Browsing the internet, updating social media and utilizing a range of office applications (Word, Excel or non-Microsoft alternatives) are all easy tasks with this iMac. Whether it's for home or work, the capability of this iMac will suit your needs. With the ability to run programs like Adobe Photoshop and Logic Pro X this is also a great choice for any design purposes. A few more features included are a built-in FaceTime HD camera, microphone and stereo speakers which makes it great for video calls and video conferencing. To summarize, this iMac will provide a great value, reliable computer with good all-round performance. Is the Apple iMac 21.5" i5 2013 right for you? It’s an easy to use model that looks great and includes all of Apple's excellent feautures such as locktight security and long-lasting reliability. If you need an All-In-One computer to complete office work, or study for your school, college or university education, then it is the perfect machine with more than enough memory for you. With this being a refurbished model, a major benefit of course is the price. This mean you get the experience of ‘like new’ at a fraction of the cost. If you would like to find out more about this huge IT brand and their great products, please click here. What does refurbished stock mean? At Hardware Associates, our stock has been refurbished by exprerienced engineers and is as good as new. It works perfectly, may have some marks or scratches around the exterior but we guarantee that there will be no blemishes on the screen. 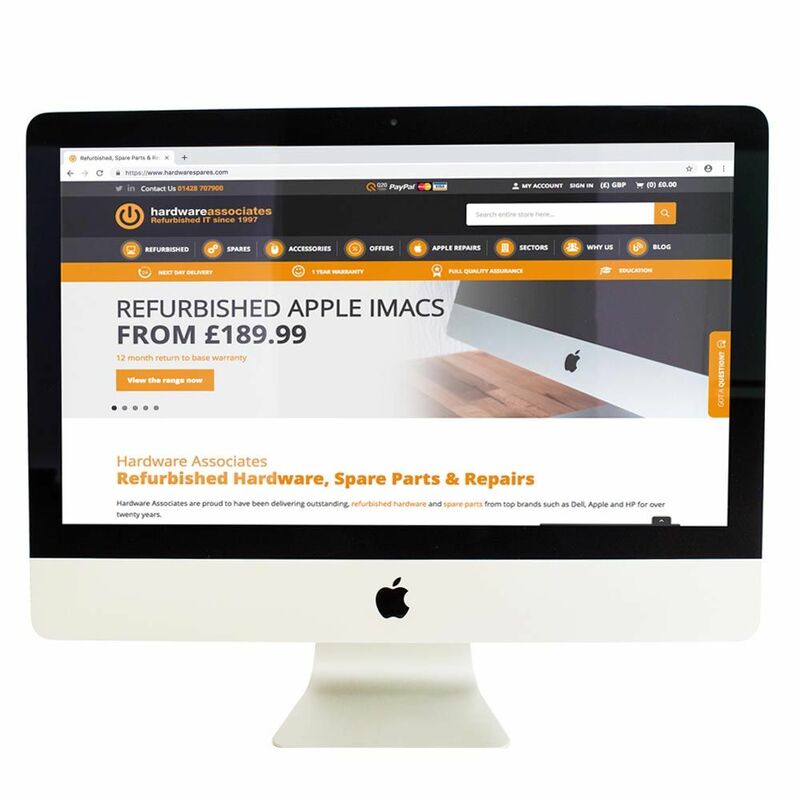 As a fully refurbished iMac, it comes under our Q20 Promise complete with a 12 month warranty so you can buy in confidence. The Intel Core i5-4570R is a Haswell, Quad Core 2.7GHz processor was launched in 2013. The efficiency was drastically improved on wih this processor from it's 3rd Gen predessor. Why buy this 21.5" iMac from us? We have over 25 years’ experience in refurbished IT and regularly work on large projects with education institutions, international businesses and of course, individual buyers. We take great care in the quality of our work and are very open and transparent with our customers. We are also accredited as a result of our skills and proven ability. We always give you as much information as possible on our iMacs, but sometimes it’s better to talk to one of our team, especially if you have direct questions or would be interested in ordering multiples of this product. To get in touch, call our team on 01428 707900 and we’ll be happy to help. If you’re enquiring out of hours, leave us a message, submit your question to our live chat, or complete our enquiry form.